Pansy lake trail (#551) to Dickey Lake (#549) – I wanted to explore this area since this was recommended by someone when Carly and I backpacked into Big Slide Lake this summer. He said there was one campsite on the backside of Dickey Lake that was nice. 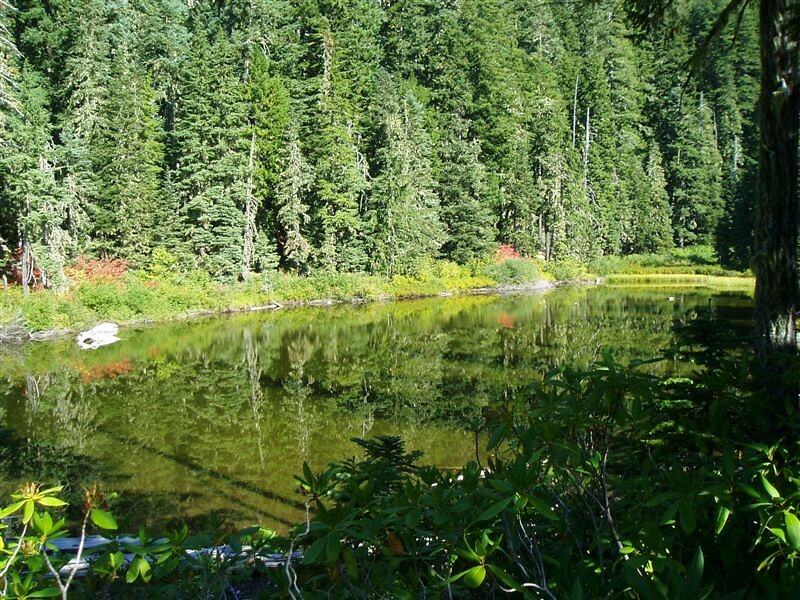 The Pansy lake trail is very nice, with lots of big trees and a well maintained trail. The trailhead looks like it could be crowded sometimes, but there was only one group camping at the trailhead, and one woman who came in right after me (but she hiked to the lookout). About a mile up the trail, it split off to Dickey Lake, kept climbing, and finally made it to the lake. Dickey Lake is a small, pretty shallow lake, with not much trail around it. I walked all the way around, but it was pretty difficult to make it (tough cross country). I found the campsite, but it wasn’t too big. I doubt I’d camp there unless I couldn’t find something else more suitable. It was a nice hike, but I was in quite a hurry to get home before 5:00. – I MADE IT!